When the Porsche 917K hit the racing circuit, it made waves with victories at Le Mans in 1970 and 1971. This historic race car achieved further fame when it was driven by actor Steve McQueen in the classic film Le Mans (1971). 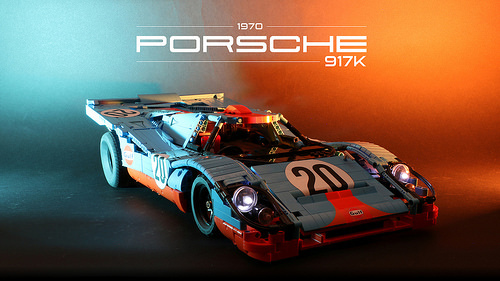 McQueen’s 917K sported the Gulf racing team’s bold but beautiful light blue and orange livery. This particular version of the car holds a special place in Pawel Kmieć’s heart, so he painstakingly scaled it down into a terrific remote-controlled Technic model. Pixeljunkie is back on the scene, turning once again to the pages of automotive history. You might remember us sharing his 1955 Buick squad car and luxurious 1930s convertible. 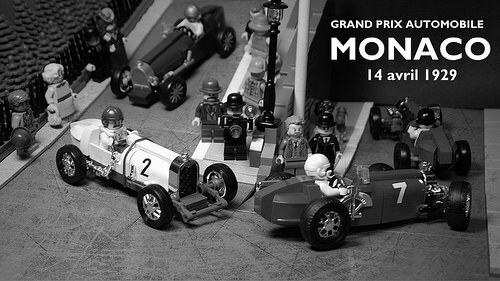 This time, he brings us a French racing legend in the form of the 1928 Bugatti Type 37A. Back then the competition for consumers was fierce, and touting a car’s racing performance was used as a means of advertising. We have to give Pixeljunkie the Golden Cup for this one because it is every bit as epic as the car it is based on. The lovely blue and white color scheme, the shiny trim, the little windshield…I love it all. 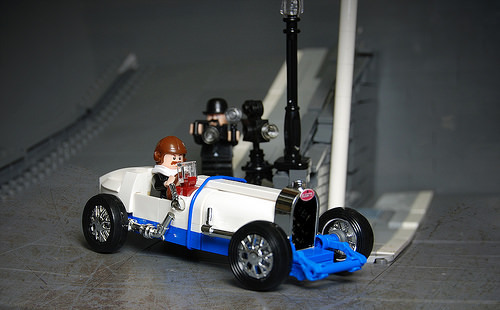 Despite his ongoing thirst for speed, Pixeljunkie has since taken time out of his schedule to recreate a scene from the 1929 Monaco Grand Prix. There’s even a cameraman ready to photograph the fantastic finish! Now that you are caught up on Bugatti’s heritage, what not race on over to our review of the cutting-edge Chiron? Nothing screams American metal and gasoline-fueled testosterone like the Dodge Viper. 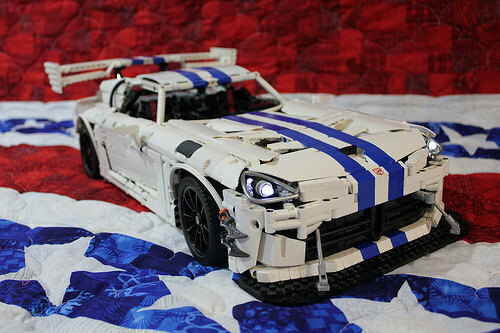 This remote control Technic Dodge Viper comes courtesy of MRX Lego. 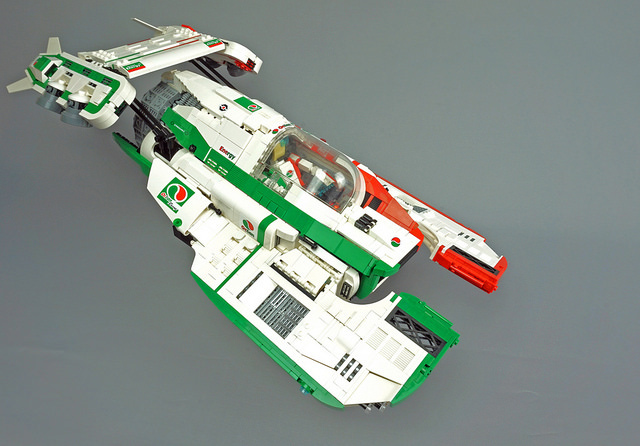 Of course, a model couldn’t claim the title “Viper” without a white body and blue racing stripes. 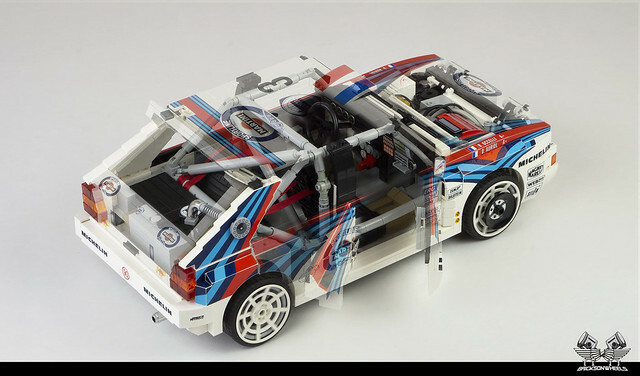 Additional stylistic details include a front air dam (made of SYSTEM plates), racing seats, a moving (but fake) shift knob, and a massive rear wing spoiler. The interior includes an actual headlight switch under the dashboard that operates the front headlights. According to any fan of motor racing series, there are exactly 18 sights in a tiny city-state of Monaco. Of course, these are 18 iconic turns of the Monaco Gran Prix circuit, each is unique and has its own character. 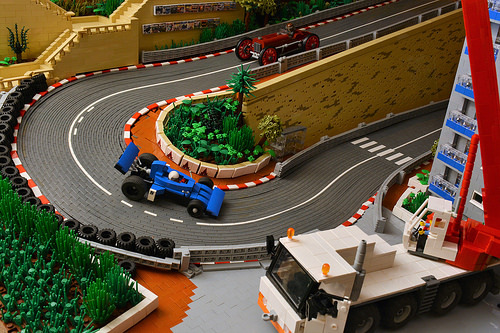 Building the whole track with LEGO bricks would be quite an ambitious task, but Simon Pickard absolutely nails, probably, the most beautiful of them — the famous Grand Hotel Hairpin. Actually, the Grand Hotel Hairpin is the slowest turn in the whole Formula 1 calendar, which is taken by modern cars at approximately 40 mph/65 kph. The way Simon recreated the road surface with hundreds and hundreds of tiles keeping the road markings and the curbs is especially noteworthy, not to mention a pretty couple of racing cars from different motor sport epochs. As Sebastian Vettel spectacularly claims his 50th pole position in the yesterday’s qualifying session of the Mexican Grand Prix, there is no better time to look back at the car that has won the very same race in 1970 — the legendary Ferrari 312B. 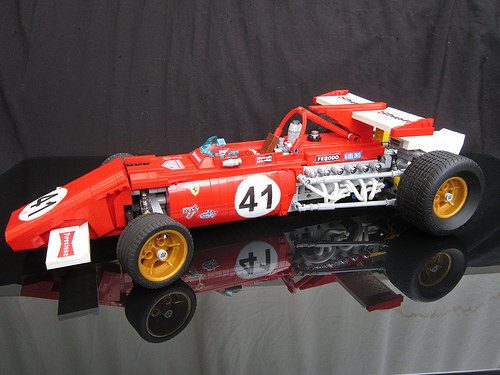 A stunning 1:8 scale copy of the car by Greg998 captures all the glory of the machine that once was called “the secret weapon” of Ferrari and which brought the team 10 wins and more than 20 pole positions. Of course, the part that deserves the most attention is the legendary flat-12 engine in the back of 312B. Bonus points are for shiny chrome round plates! 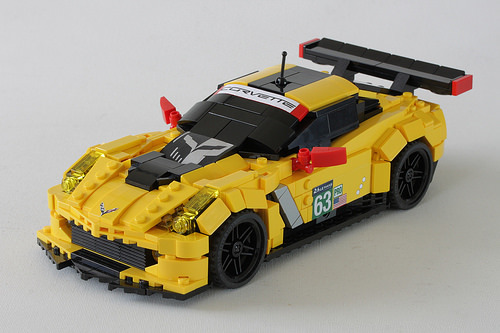 For his latest scale model Lasse Deleuran has chosen a magnificent Chevrolet Corvette C7.R Le Mans Edition, which is famous for its multiple victories in the most prestigious endurance races in the motorsport world. Lasse recreates the car’s wide hood with some sharp wedges and slopes so that the vehicle definitely looks more aggressive than the smooth original. 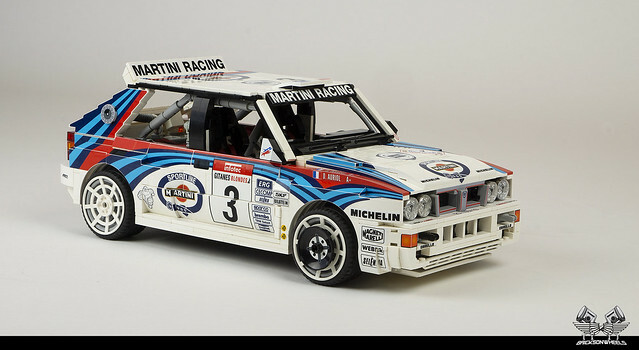 Bonus points are for very accurate custom stickers, which are an inevitable part of a true racing car’s design. Look twice—those aren’t sideways cars, they’re COSMO Pods, the kit-built racers of the future. Designed by Volker Brodkorb, each of the vertically oriented pods is souped up to match its driver’s style and outfitted with a unique engine, and then splashed with a classic paint job hearkening back to the old petrol-powered four-wheeled racers of yore. Of course, I’m rooting for the Ford GT40-inspired pod, because who doesn’t love that iconic blue and orange Gulf livery? 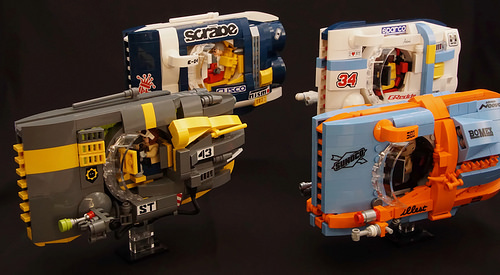 It’s the lead up to the Formula Zero Gravity Championships for Octan Racing’s Tigress. 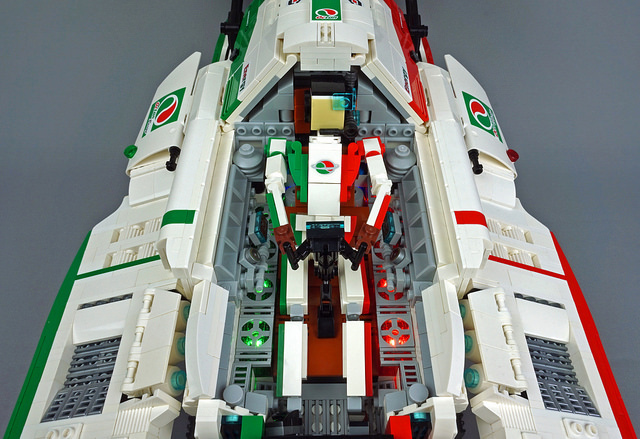 Piloted by a rookie racing under the name Octana, this larger-than-minifigure scale racer is ready for its paces. 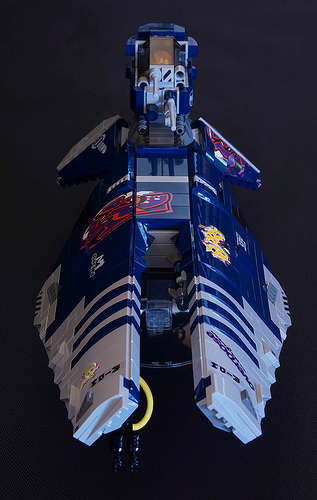 Builder Tim Goddard has used a variety of interesting techniques to get the amazing angles and sharp lines of this beastly speeder. The body appears to be an extension of the cockpit window, which has been wrapped around a massive rear engine. Plus, there’s the great use of regular and inverted tall slope bricks opposite each other to create interesting panel lines. Slap on a hefty rear stabilizing wing with a handful of maneuvering thrusters and coat liberally with Octan livery and you have yourself an incredible racing monster. As the competing teams continue to work on their racers for a warm up race in Leicester this weekend, I think Octana and her ferocious feline are in for a fantastic racing season! It’s still more than 80 days before the next Formula One racing season starts, and the all-new racing cars are still scheduled to be revealed in February. In the meantime, let’s have a look at a vehicle that stays behind the scenes, but still helps drivers make their way to the finish flag. 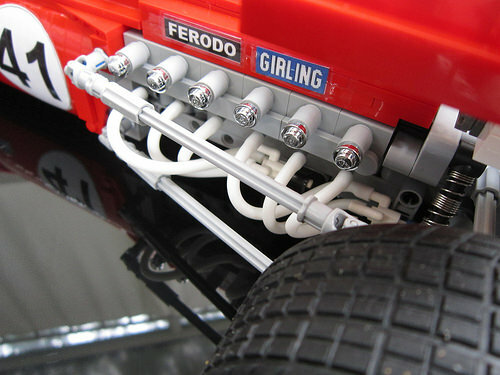 Ryan Link, a huge Ferrari fan, surprises us with a LEGO version of the iconic Scuderia Ferrari transporter. 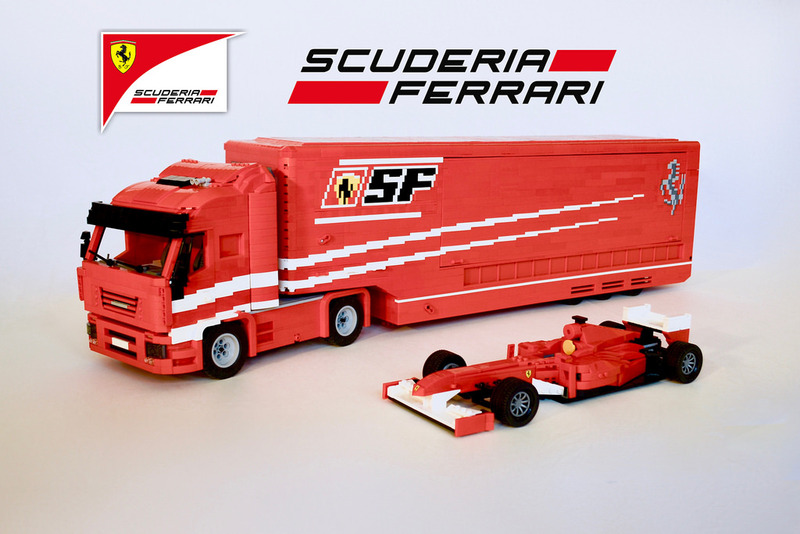 I bet the scene below will instantly remind many of our readers of the legendary 2005 set 8654 Scuderia Ferrari Truck, which was absolutely cool. Unlike the trailer in that set, all of the signage on Ryan’s one is brick-built, from the diagonal stripes to the Ferrari logo at the back! 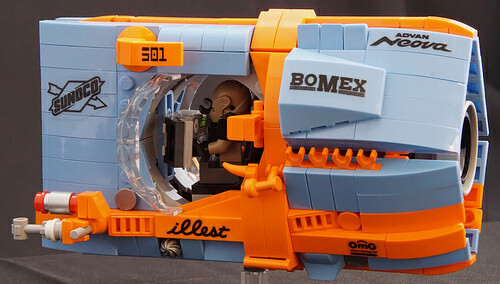 Don’t forget to check out more pictures in the builder’s album.